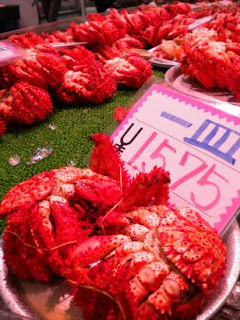 Hokkaido is known for many things, but the first thing many Japanese people will mention right after they say how beautiful the island is is the seafood. They lean forward a bit and say with great passion: "The seafood is very good, very fresh." 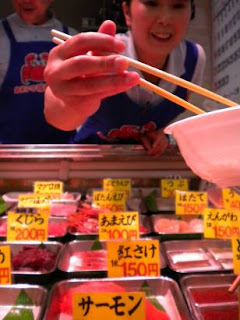 And as one of the world's leading consumers of fish as well as fishing, the Japanese should know. Since this year's visit focused on the eastern coast of the island, we decided it was time to finally sample some of the island's famed fare. A friend recommended visiting Washo Ichiban not far from Kushiro's port. 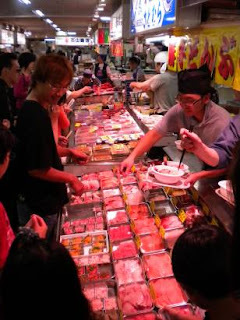 Here a visitor could wander aisles of any number of sashimi vendors to eyeball and choose whatever piece of fish looked the most delectable. A diner might sample the day away trying fish not found in other parts of the country, or in our case never seen before in our little part of the Midwest. We remained relatively tame with samples of salmon, tuna, squash (a vegetable geek even when surrounded by fish), sanma (in season at the moment), and aji. Other diners all around us, though, were not so shy and we saw bowls heaped with squid, crab (also in season at the moment), octopus, and other fish I've never met joyously devoured in short order. This little indoor fish market also offered up other famous Hokkaido delicacies: a zillion different varieties of seaweed, cheese, fruit, fish jerky, and pickled fish. One stall sold perhaps some of the most amazing pickles I've ever had, but unfortunately photos weren't allowed. They were delicious, though, with our camp lunch the next day! Buy a bowl of rice as big or little as you wish, and start wandering the aisles.